CHICAGO – In our latest special edition of HollywoodChicago.com Hookup: Film, we have 50 admit-two advance-screening movie passes plus three grand prize packs up for grabs to the highly anticipated new film “Contagion” with Matt Damon, Kate Winslet and Jude Law! The film, which also stars Gwyneth Paltrow and Laurence Fishburne, opens everywhere on Sept. 9, 2011. To win your free “Contagion” admit-two advance-screening movie pass with your chance at the grand prize packs courtesy of HollywoodChicago.com, just refer a few friends to the free, no-spam HollywoodChicago.com mailing using this secure, Web-based submission form. That’s it! This advance “Contagion” screening is on Tuesday, Sept. 6, 2011 at 7:30 p.m. in downtown Chicago. Directions to enter this Hookup and win can be found beneath the graphic below. The movie poster for “Contagion” with Matt Damon, Kate Winslet and Jude Law. Academy Award winner Steven Soderbergh (“Traffic”) directs “Contagion”. The film brings together a stellar international ensemble cast including Academy Award winner Marion Cotillard (“La Vie en Rose,” “Inception”); Academy Award winner Matt Damon (“Good Will Hunting,” the “Bourne” films); Oscar nominee Laurence Fishburne (“What’s Love Got to Do With It,” “The Matrix”); Oscar nominee Jude Law (“Cold Mountain,” “Sherlock Holmes”); Academy Award winner Gwyneth Paltrow (“Shakespeare in Love,” “Iron Man”); and Academy Award winner Kate Winslet (“The Reader,” “Titanic”). “Contagion” follows the rapid progress of a lethal airborne virus that kills within days. As the fast-moving pandemic grows, the worldwide medical community races to find a cure and control the panic that spreads faster than the virus itself. At the same time, ordinary people struggle to survive in a society coming apart. Directed by Steven Soderbergh from an original screenplay by Scott Z. Burns (“The Bourne Ultimatum,” “The Informant!”), the film also stars Bryan Cranston (AMC’s “Breaking Bad”), Sanaa Lathan (“AVP: Alien vs. Predator”) and Jennifer Ehle (“The King’s Speech”). The film is produced by Michael Shamberg, Stacey Sher (“World Trade Center”) and Gregory Jacobs (“The Informant!”) with Jeff Skoll, Michael Polaire, Jonathan King and Ricky Strauss serving as executive producers. Director Steven Soderbergh’s creative team includes production designer Howard Cummings (“Percy Jackson & the Olympians: The Lightning Thief”), Oscar-winning editor Stephen Mirrione (“Traffic”) and costume designer Louise Frogley (“Quantum of Solace,” “Ocean’s Thirteen”). Cliff Martinez (“Traffic”) composed the score. 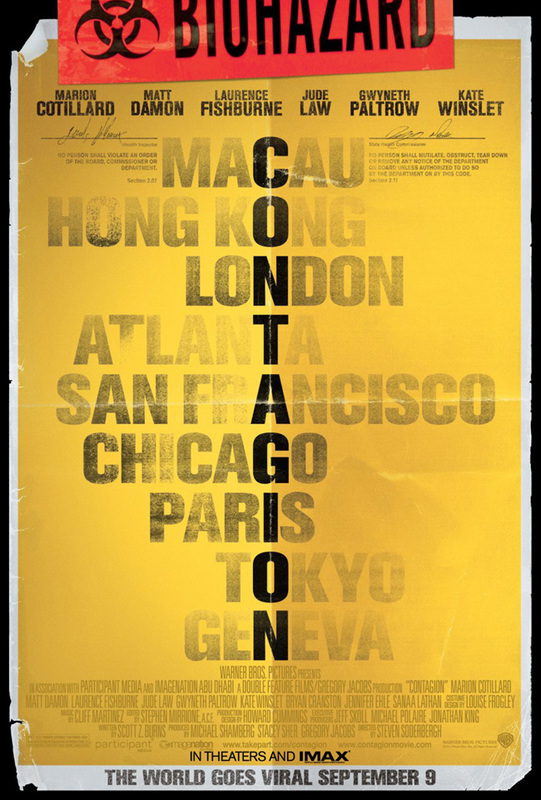 “Contagion” was filmed on locations around the world including sites in Hong Kong, Macao, Chicago, Atlanta, San Francisco, London and Geneva. Watch the movie trailer for “Contagion” now below. To win your free “Contagion” admit-two advance-screening movie pass and for a chance at our “Contagion” grand prize packs, you must be logged into your HollywoodChicago.com Web site account. If you don’t yet have one, you can quickly register here. Having a free Web site account with a valid e-mail address is required to win this HollywoodChicago.com Hookup. Next, simply refer a few friends to the free, no-spam HollywoodChicago.com mailing. You must submit your referrals using this confidential, Web-based submission form. Comments have been disabled on this page. You must include your first and last name, e-mail address, mailing address and friend referrals in your submission. Your personal information will not be sold or shared, will be kept strictly confidential and is only for awarding winning entries. The e-mail address referrals of your friends will not be sold or shared. They will be added to our mailing list only. The more e-mail addresses you submit, the better your chances of winning! Your assistance in helping us grow our mailing list brings you bigger and better giveaways. Our non-annoying mailing, which isn’t sent too often, regularly announces our top-notch entertainment giveaways. Our mailing adheres to all laws required by the CAN-SPAM Act and always provides an unsubscribe link. Please submit your referrals below. Submit the e-mail address referrals of your friends here to get hooked up with “Contagion”! This Hookup is simple: 50 lucky HollywoodChicago.com readers will be randomly selected as the winners of our “Contagion” advance-screening movie passes plus four additional lucky readers will win our “Contagion” grand prize packs! The grand prize packs will be mailed to the HollywoodChicago.com winners at our expense. Good luck!